 Domina St. Petersburg 5*, the first property of international Italian hotel chain Domina in Russia, welcomes in the very heart of St. Petersburg with home warmth and sincere hospitality. Situated on the quiet Moika river embankment, a step away from Saint Isaac’s Cathedral, in the noble mansion of XIX century the hotel combines convenient location and charismatic Italian design. 109 rooms of different categories and colours, two-storey lifestyle rooms with the panoramic river view, author’s design concept 5D Lifestyle, restaurant and cocktail bar, wellness center, concierge service – we will care to provide you comfortable and enjoyable stay. Discover the five dimensions of Venice of the North with Domina – choose the colour of your journey, it will definitely be the bright one!